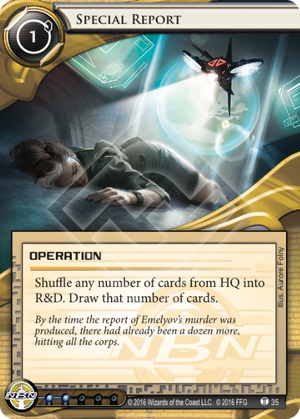 Can the Corp play Special Report and choose to shuffle 0 cards into R&D? Can the Corp play Special Report when it is the only card in HQ. Yes, Special Report can shuffle R&D even if you have no other cards in HQ, so it has the potential to change the game state and can be played. Can the Corp play Special Report when there are no cards in R&D? Yes, unless there would be no cards in HQ when Special Report is played, in which case it does not have the potential to changed the game state. So, between this card, Rumor Mill, and the officially spoiled Preemptive Action, the FFG dev team is giving us a pretty clear message: "Jackson Howard is eventually going to rotate, prepare your butts". See, Jackson provides a number of important functions for the corp. He provides accelerated draw, recursion, and a way to vent off agendas if you get flooded, along with an on-demand shuffle. Special Report fills the agenda venting and on-demand shuffle aspects of Jackson, and goes a decent way towards helping you draw to find what you need, but it only affect cards in HQ. Anything in Archives will need a different card to recover. So in that respect, Special Report is worse than Jackson. It also requires a credit to play. And it's two influence instead of one. With all that in mind, is it playable? I think the answer comes down entirely to how popular Rumor Mill becomes, and how much importance people place on being able to reliably avoid agenda flood. One scenario is that Rumor Mill becomes common--maybe not in every deck, but in enough that dumping agendas in Archives with a Jackson on the table is a liability. If this happens, I expect the meta to shift strongly away from glacier, and more towards shell-game, rush, or kill decks. This is because Glacier relied heavily on not only Jackson, but also Ash 2X3ZB9CY or Caprice Nisei (and occasionally Sandburg) to close out games, and Rumor Mill is effective against these as well. If this happens, I expect that NBN will trade out their three Jacksons for three Special Reports and call it good. Other factions will have a trickier choice. Playing Jacksons is less expensive influence-wise, and a better card if Rumor Mill isn't in play...but relying on him too heavily is a disaster. On the other hand, a playset of 3x Special Reports is a whopping 6 influence, which is a problem. Most decks, I imagine, would drop down to two flood-management cards, either 1x Jackson Howard+1x Special Report or 2x Special Report, depending on how much influence they had. But this might not happen. Just like Clot weakened but did not kill Fast Advance, perhaps Rumor Mill will weaken but not kill Jackson Howard. There might be ways to play around Rumor Mill that remove a lot of its bite. And Rumor Mill is two influence a copy, so most Shapers and Criminals won't run a full playset (Fisk probably would, though.) If this shakes out, and Rumor Mill doesn't become a meta-shaping force, then I expect people will just keep playing Jackson up until the last possible moment. The only corp that would say should definitely use Special Report over Jackson is Cerebral Imaging. See, Special Report lets you throw back as many agendas as you have in your hand, compared to Jackson's three. On top of that, Jackson requires that you overdraw and discard, but being at max hand size is risky for CI; one bad Account Siphon and you might lose a lot of options. For this corp, it's Special Report or nothing. So how good is Special Report? I guess we'll find out.